We may be brought up drinking it in our tea, pouring it over our cereal and even sipping on a cold glass at meal times, but for many of us cows milk causes more problems than it helps to solve. It may be a great source of calcium and vitamins, but it also contains high sugar and fat content which help baby cows to grow big and strong. As fully-grown humans, we simply don’t need the same nutrients as a newborn – and we certainly don’t need the hormones that are pumped into cows to ensure they’re lactating continually and producing enough milk for the farmer to make a living. I gave up cows milk about four months ago and have never felt better; not only has it helped alleviate my bloating and digestive problems, but I don’t feel so bogged down and feel like I’m carrying a food baby with me wherever I go. Here’s my story of why I gave up cows milk and why I’m never going back. Over the last five or so years I’ve developed a huge number of allergies and intolerances that have seen me visit the doctor numerous times for help. Not only were they incredibly useless, issuing advice such as “if you think it makes you sick, don’t eat it” (thanks genius!) but didn’t seem to understand how much digestive problems can impact a normal life. Out of nowhere I started to suffer from bloating, constipation, upset stomachs and general tiredness; I started to cut out certain things from my diet, but nothing seemed to make a difference. My stomach was completely unpredictable (or so I thought,) bloating up so badly that I frequently got offered seats on the tube; I literally looked six months pregnant. It was only when I undertook a generic allergy test, because of another reaction, that I found out I was severely intolerant to cows milk. Having been a coffee addict (it’s my only vice) for about ten years, spending a lot of my time in Starbucks sipping on lattes, it never occurred to me that this daily ritual was causing me so many issues. From that day I started to cut out cows milk and replace it as much as possible with Alpro Soya, a slightly heavier and nuttier alternative that actually tastes really yummy. Although it took a little time to get used to, now I actually prefer the taste of soya milk and happily sip my way through multiple coffees in a day. The great thing is that the majority of restaurants, cafes and coffee shops now offer soya milk as an alternative; even Starbucks, Costa and Nero offer it as standard. I don’t feel in any way shortchanged or at a disadvantage because I don’t drink cows milk – it’s become so mainstream and normal, that it’s not even difficult to make the switch. However, it’s worth noting that cows milk is also present in everything from butter to chocolate to ice cream; if you have a serious allergy it’s worth minimising the amount of food and drink you consume that contains cows milk. I don’t eat a huge amount of butter or ice cream, but I have noticed (now I’m aware) that chocolate causes a similar reaction in my stomach – bloating and slight irritation. Although it’s fundamentally the same thing, I have found that because I’ve given up 95% of cows milk my body can cope with a little chocolate or a small treat here and there: for me, the issue was the pure amount I was consuming without realising. There has been a lot of talk about the negative side effects of consuming cows milk, not only for the digestive system but on the skin. Eliminating or reducing cows milk can help with acne, eczema and psorasis too, mainly because of the hormones which play havoc with our own and cause imbalances. I’ve recommended to a few friends to reduce the amount of cows milk they consume, swapping it for soya alternatives, and they’ve definitely seen a difference in their skin; even my mother has made the switch as soya is incredibly good for joints and helps with her fibromyalgia (a painful degenerative condition) and arthritis. If you’re considering making the switch or ditching cows milk for good, I’d definitely give it a go and see how much of a difference it can make to you… After four months I suffer from hardly any bloating, feel much more energetic and don’t have to rush to the loo in a panic. It’s one of the best things I’ve ever done and there’s no way I’m going back to the moo-ers. Have you ever considered giving up cows milk? OMG I can really relate to you! I was exactly the same as you – loved and enjoyed my lattes made with cows milk, though skimmed or 1% but I was always so bloated and looked 6 months pregnant! I was advised to change over to soya milk by my doctor so I did early last year and I no longer get bloating or feel so tired! The only complaint I have is that it is more expensive than the usual cows milk but I am willing to pay more for something that I feel is helping my symptoms and body. I still eat butter (though not much at all) and I don't really eat ice-cream or chocolate anyway. I have started to buy the dairy free desserts, like flavoured custards, which are really nice. I must admit, it did take me a little while to get used to the taste of soya milk but now I would never consider going back to cows. So I completely relate and agree with your post and recommend changing to anyone who suffers from bloating, constipation/loose stools or tiredness – you may be surprised! This was nice to read as I gave up cows milk about 3 years ago for the same reasons. 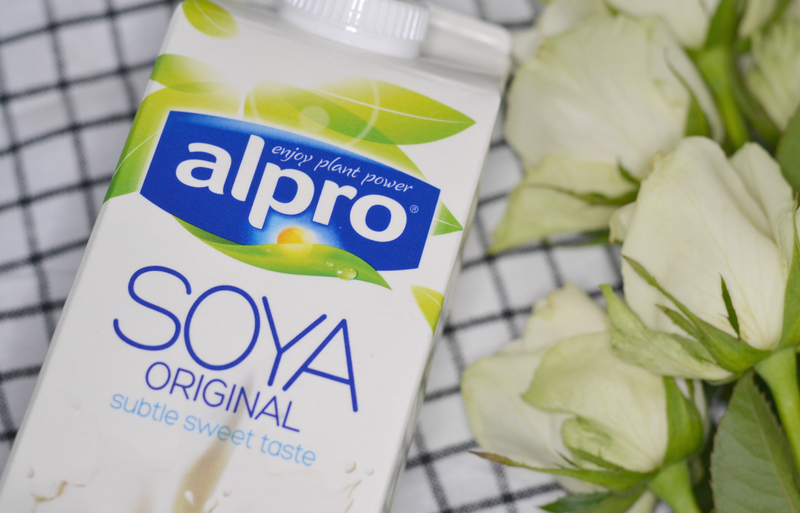 I switched to soya milk for a year or two but then found out that it also has a lot of negative press, such as changing oestrogen levels and being linked to breast cancer in women. I've since switched to rice or coconut milk. Coconut milk is my personal favourite as it is tasty enough to drink my itself, and rice milk is just like soya milk (but tastes a bit better in my opinion). Love this post, but I want to make a comment about it.I'm lactose-intolerant and after advice from my dietitian I switched to soya milk. At the beginning everything was fine and well, but suddenly I got the same symptoms when drinking regular milk. It turns out I also developed an intolerance for soya milk, because it is an allergen. Also soya can lead to other problems (for example fertility problems, because soya is similar to estrogen).Now I try to avoid soya as much as possible and my alternatives are coconut milk, rice milk and almond milk. Seriously reducing my intake of cow's milk has really helped with my rosacea. I never realised before how much I was drinking/eating. Cutting it out completely wasn't realistic for me, but reducing it has really helped me and made me feel a lot better. I gave up cows milk about 8 months ago. Went from soya milk to almond milk to oat milk as wanted to try them all but now have tea & coffee black! I still eat cheese occasionally but have no issues, the milk was the culprit…. I dropped dairy after I heard that the industry was driving the badger cull in the UK. I felt so much better immediately-my skin cleared up (suffered from milia on arms and legs), lots quite a lot of weight and a nasty persistent eczema patch on my head never returned. As a colon hydrotherapist, I can say without reservation that giving up dairy products helps at least 70 % of my clients ( those who do it consistently) .Its a primary allergen to be sure, and some folk are lactose intolerant and didn't realise it. Soya is good , but there are other alternatives too: almond milk, hemp milk etc. Ring in the changes . Don't load up too much on soya, as there are problems with it too.Moderation is wise.